China-based Huawei made a popular name in the budget smartphone arena in India by launching budget 4G LTE-enabled smartphones in the country under its sub-brand that goes by the name Honor. The brand has been releasing devices in different price ranges under the Honor range to cater entry-level to high-end users. In the mid-range segment, Honor’s latest offering in this segment is the Honor 7. As far as the competition is concerned, there are several devices to go against the Honor 7 in India in the same price and feature range. Motorola’s Moto X Style is one of these devices that offers features to go hand in hand against the Honor 7. If you are planning to buy a loaded smartphone with premium design in the sub- Rs 30,000 range, the Honor 7 and Moto X Style are among the best offerings. Let’s compare their specs to find out how they stand against each other on the table. The Honor 7 from Huawei offers a more durable design than the Moto X Style thanks to a full metal design. The Honor 7 offers a quite slim 8.5mm waistline and weighs 157 grams. The Moto X Style, on the other hand, measures a tad thick at 11mm around the waist and weighs 179 grams. Overall, design-wise, the Honor 7 and X Style will impress the users of their own taste. The Huawei Honor 7 is a compact offering with a 5.2-inch full HD display and a pixel density of 424 ppi. The Moto X Style offers a much better media viewing experience than the Honor 7 thanks to a larger 5.7-inch quad-HD (2K) screen that delivers a pixel density of 515ppi. The Moto X Style also gets a water repellant nano-coating that is missing in the Honor 7. On the software front, the Moto X Style and Honor 7, both run Android Lollipop with their respective brand’s custom features on top. Configuration-wise, the Moto X Style offers a 1.8GHz hexa-core Qualcomm Snapdragon 808 processor, coupled with an Adreno 418 GPU and 3GB of RAM. The Honor 7, on the other hand, utilises a HiSilicon Kirin 935 processor, aided by a Mali T628 MP4 GPU and 3GB of RAM. Storage-wise, they both offer 16GB of expandable memory. The Moto X Style also gets a 32GB edition as well. 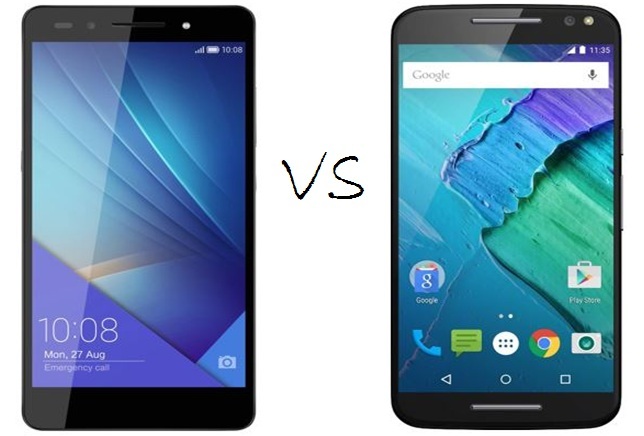 The Honor 7 and Moto X Style offer quite similar camera specifications. The Honor 7 offers a 20MP rear snapper with a dual-colour LED flash and an 8MP front snapper for quality selfies. The Moto X Style, on the other hand, sports a 21MP rear shooter with a dual-tone LED flash and a 5MP secondary snapper. Overall, when it comes to the camera, the Honor 7 and Moto X Style aren’t so different to each other. Connectivity-wise, the Honor 7 and Moto X Style offer similar specs including 4G LTE support, Wi-Fi, Bluetooth, NFC, and GPS. They are powered by quite similar batteries. The Honor 7 is equipped with a 3,100mAh battery while the Moto X Style is backed by a 3,000mAh unit. After comparing the features of the Honor 7 and Moto X Style, it’s quite clear that the Honor 7 is a more appealing offering of the duo along with a bigger battery, selfie snapper, and a compact display. The Moto X Style, on the other hand, is for those who like phablet-grade devices with higher than 5.5-inch displays and impressive camera features. As far as the pricing is concerned, the Honor 7 is priced at Rs 22,999, while the Moto X Style 16GB and 32GB editions are being offered for Rs 29,999 and Rs 31,999 respectively.